For many media companies, whether traditional or digital-only, the main focus is on the publishing of content — as much as possible, in most cases — and whatever social engagement there is with readers either takes place in a swamp of comments below a post, or is outsourced to social networks like Twitter and Facebook. In an age where social is becoming more important than search, that’s a very dangerous approach to take, says RebelMouse founder and former Huffington Post CTO Paul Berry. And he has a point. Berry says he left HuffPo and started RebelMouse because he saw what was possible in terms of combining content and community, but the barriers to actually getting there seemed almost insurmountable — especially for media startups — because there was no platform or content-management system that made that kind of thing easy. What most outlets use is what Berry calls a “Frankenstack” of cobbled-together pieces of technology. What RebelMouse started with was a service that pulled in a user’s social graph from Twitter and Facebook and whatever other social sites they belonged to, and then made it easy to aggregate and display that. But that was never really the end goal, Berry says — building those tools and APIs gave RebelMouse what it needed to design and build a fully social content-management system or CMS for media companies and brands (which are increasingly becoming the same thing in many ways, at least in how they approach media). 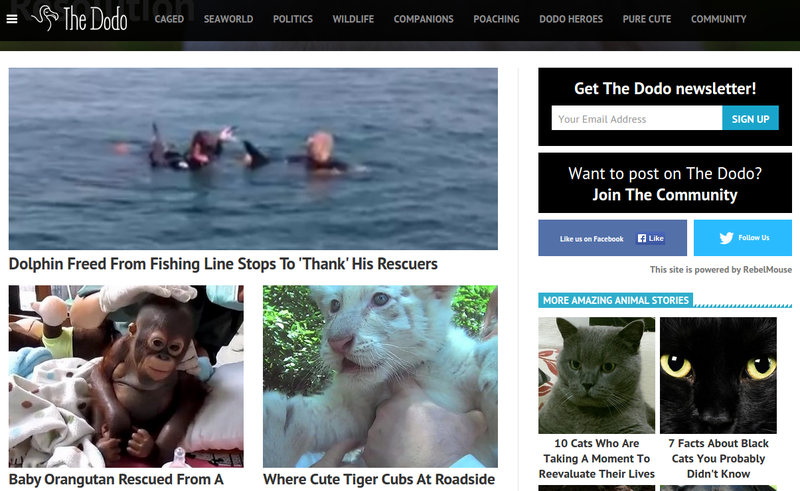 The flagship example of what that allows, he said, is The Dodo — a site devoted to animals that was launched last year and is funded in part by Lerer Ventures, the investment arm of Huffington Post co-founder Ken Lerer (who is also a backer of RebelMouse and BuzzFeed). Unlike most media sites, The Dodo has no designers, no developers, no system administrators and no mobile team: that’s because RebelMouse powers the entire thing, including the apps, and gives editors all the various levers and analytics that come from its understanding of social content. In addition to The Dodo, the company has also been building partnerships with more traditional media companies like Time Inc. and Viacom. For some, like MTV, Berry says RebelMouse just powers the social side of the company’s content — but in other cases it allows a media company like Time to experiment very quickly with verticals or online properties like The Snug, a site devoted to home decorating that is powered by RebelMouse and launched last year. More offerings like that are coming, says Berry. The other big area of growth for RebelMouse has been with brands, such as General Electric, United and Samsung, Berry says. Thanks to the web and social media, brands have the same ability to become content creators and publishers that traditional media entities do (the recent State of the Union address being a good example) and RebelMouse handles all of the back-end and provides social tools and features that it would take those brands months or even years to build on their own. One of the biggest factors in that change has been Facebook, Berry says — because unlike Google, which used to control how people found content, Facebook doesn’t want to send you away as quickly as possible, it wants to keep you on its site as much as possible, and get you to return as often as possible. 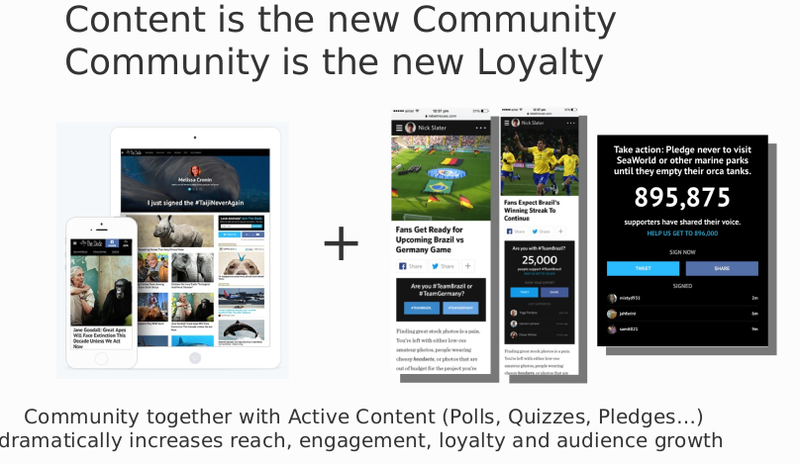 And that makes it hard for media companies to build an engaged community of their own. That’s where a feature RebelMouse calls “The River” comes in: it effectively creates a social graph on top of the one that readers already have on Twitter and Facebook, but this separate graph is part of the media outlet’s website and app, instead of occurring somewhere else. So readers of The Dodo, for example, can connect Twitter and Facebook and follow the activity of their friends within the Dodo app — but they can also follow other readers, as well as writers and editors, and interact with them. This might sound a lot like comments, which many sites either ignore or hand over to Facebook to manage, but Berry says there is a crucial difference, which is that only logged-in readers who choose to follow someone will see their comments. “That makes it a totally inhospitable environment for trolls,” the RebelMouse founder says. What it creates instead is a vertical social graph focused around the specific content of the site, which in turn increases engagement and community. Could some vertical or niche media sites take back some of their community and social engagement from Facebook and Twitter by using RebelMouse’s tools? The company is still fairly young and its promise remains relatively untested, but Berry understands social like few other people (except possibly BuzzFeed founder Jonah Peretti), so it would be unwise to count him out. There is the free version, which is really nice, and the very expensive version, which looks like it’s really really nice.